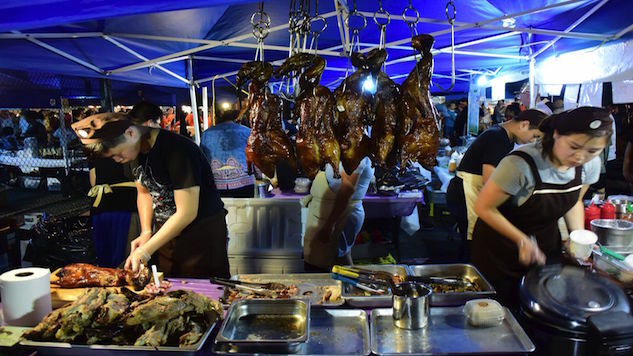 The Queens International Night Market is unlike anything else happening in New York City. Every Saturday in the summer, as the oppressive daytime heat fades into night, a solid ring of 40 to 60 blue-tented street vendors sell authentic food by Flushing Meadows Corona Park from 6 p.m. to 12 a.m. The selection is almost as diverse as the borough itself: Peking duck stuffed in steamed buns, paella, custom French-toast PB&Js with syrup and strawberries. It rivals the selection of Brooklyn’s Smorgasburg, but without the prevalence of fedoras, beards and plaid. If Queens is a microcosm of the world — the 2000 U.S. census listed more than 130 languages — then the Night Market is a microcosm of Queens. Best of all, everything tops out at $5. This is the Night Market’s second year. It was started by John Wang, a Texas native with business and law degrees from Yale. Wang grew up spending his summer’s in Taiwan, where night markets flourished and culture spread. The trips inspired him to create something similar in 2013 that focused on the people. It worked. I took a lap around the snaking lines of Queens natives and regulars who had formed snaking lines in front of vendors when I arrived on July 16. It’s easy to be overwhelmed, but it’s comforting to know that your budget won’t be. Live performers play music next to the beer stand selling $5 16-ounce beers and glasses of wine. Plenty of people are taking pictures of their food, but more are just enjoying it. You’ll want to sample pretty much everything, but here are the five you shouldn’t miss. Quick note: pick wisely, as nine out of 10 times the portions are shareable. Not many people have the opportunity to sample food from Burma, also known as Myanmar. potato, peas and a curry sauce. Tiger beer tallboy straight from the can. mozzarella is melted between two circular pieces of spongy, buttery sweet corn bread. Skewers of squid are served spicy with red chili pepper at Mama’s. Thick cut pieces are stacked side to side, and then topped with bite-through tentacles that wiggle with every step. There is a time of night when nothing can satisfy like something sweet. Twister Cakes are thin, hollow and peel open like an unraveling Slinky. The outside is glazed to a caramel crunch, and can be topped with cinnamon, sprinkles, nuts or chocolate. For something more familiar, Twister Cakes offers one in the shape of a waffle cone filled with ice cream. Notable mentions: Korgaicorp’s Thai sweet and sour meatballs, hotdogs from Chilean Completos, seafood yakisoba from Tei Nei Ya, and Brazilian chicha morada from Inti Sumaq. location can be reached by public transit by taking the number 7 train toward Flushing to 111th Street.